We’re told that a picture is worth a thousand words, but this adage robs words of much-deserved credit. When you’re an infant with a rapidly developing brain, words are one of the most valuable things you can receive. They’re so valuable that a new initiative in Georgia called “Talk With Me Baby” promotes the importance of “language nutrition”. When it comes to language, infants are sponges: essentially every baby growing up in a normal environment masters the complex language system he or she’s exposed to. It helps that the adults around them hold up objects and emphatically enunciate their names, saying something like “ba-na-na” while waving the fruit in the child’s face, but that’s not the only way babies learn. Infants are constantly immersed in linguistic environments that are full of people expressing real and complicated thoughts through varied sentence structures. This provides the rich experience that children need to rapidly become fluent speakers. If you’ve ever tried to learn a new language in your teens or later, you know that this sponge-like capacity doesn’t last forever. Talk With Me Baby makes no bones about why they want to increase the amount of language that babies are exposed to: hearing more words in infancy promotes stronger language skills, which in turn form a foundation for academic and other successes throughout life. Why are words so crucial during infancy? The idea that there’s a sacred window of time in which language can be learned – referred to as a critical period – was first articulated in 19591, but it’s still a widely researched and debated topic. There isn’t yet a consensus on whether attempting to learn (a first) language after the critical period is futile or just more difficult than learning it earlier, and if there is a critical period, researchers still debate about exactly when that period is. Since intentionally raising a child without linguistic input (exposure to language) would be unethical, much of the support for the critical period hypothesis comes from tragic cases of children who grew up in abnormal environments that lacked language. Genie is a classic example of a girl who spent her entire childhood locked in a room without any stimulation or proper nourishment until she was discovered at 13 years old. At that time, researchers tried to provide her with therapy for her physical and cognitive abnormalities. Although she seemed able to learn a limited vocabulary, most scholars claim that Genie never truly learned language: she could not use grammar to put words together in a meaningful way. Although her case suggests the importance of receiving linguistic input during the critical period, it’s unclear whether Genie was disadvantaged from the start – her father claimed that he locked her up because she was cognitively disabled – and there are many other aspects of Genie’s deprived childhood that could have contributed to her inability to learn language at 13. There are a few characteristics of the developing brain that speak to why we might be better at absorbing language as babies than as adults. For one, a critical period is not unique to language. Other biological processes also have their own critical periods2. Some of these periods have been demonstrated most clearly in animals deprived of specific sensory stimuli. For example, Hubel and Wiesel studied a cat whose eye was sewn closed as a kitten. When they removed the stitches, the cat was still unable to see out of the previously deprived eye. During the deprivation period, the visual cortex became dominated by the normal, unobstructed eye, which hijacked the brain space typically devoted to the second eye. The cat’s visual cortex demonstrates a crucial feature of the brain: its plasticity. Neuroplasticity refers to the brain’s ability to reorganize itself based on the inputs it receives. Our brains are constantly reorganizing themselves (that is how we learn anything), but infants’ brains are especially plastic3. Developing brains are highly sensitive to incoming information and experiences, allowing them to learn massive amounts of information rapidly. Perhaps counter intuitively, another explanation for why immature brains are ripe for language learning is that their prefrontal cortex (PFC) – the area of the brain most associated with higher-level and rational thinking – is undeveloped4. A paper by Sharon Thompson-Schill, Michael Ramscar, and Evangelina Chrysikou gives an example of watching a football game to highlight how adults’ and toddlers’ pattern-learning strategies differ. In the example game, you notice that the team passes the ball 75% of the time and runs with it the other 25%. Your task is to predict what the team will do in subsequent plays. As an adult, you’re likely to match probabilities: 75% of the time you’ll guess that the team will pass, and the other 25% you’ll guess that it’ll run. You’ve taken the less frequent event (the run plays) into account. However, since you don’t know when those rare events will occur, the optimal strategy would actually be to always guess that the team will pass. That’s precisely what a toddler would do. Toddlers ignore irregularities and grasp conventions quickly, at least partially thanks to their undeveloped PFCs. Thompson-Schill and colleagues argue that toddlers’ tendency to ignore inconsistencies might be ideal for learning the foundations of language, especially the syntactic patterns that govern our grammar. Toddlers eventually discover and master their language’s irregularities, moving from forms like “drinked” to “drank” as their PFCs develop and help them filter exceptions to rules. Infants’ and toddlers’ brains are ready and waiting for linguistic input. This input allows their brains to develop new neural pathways in response to the language conventions they’re exposed to. As they get older and continue to use language more (whether they’re listening, speaking, reading, or writing), these pathways continue to strengthen. Talk With Me Baby asserts that “early language exposure is the single strongest predictor of third grade reading proficiency,” and that third grade reading proficiency, in turn, predicts further academic and economic successes. This is because third grade is when most kids transition from learning to read to reading to learn. In this way, linguistic exposure as an infant has cascade effects that last long after infancy. 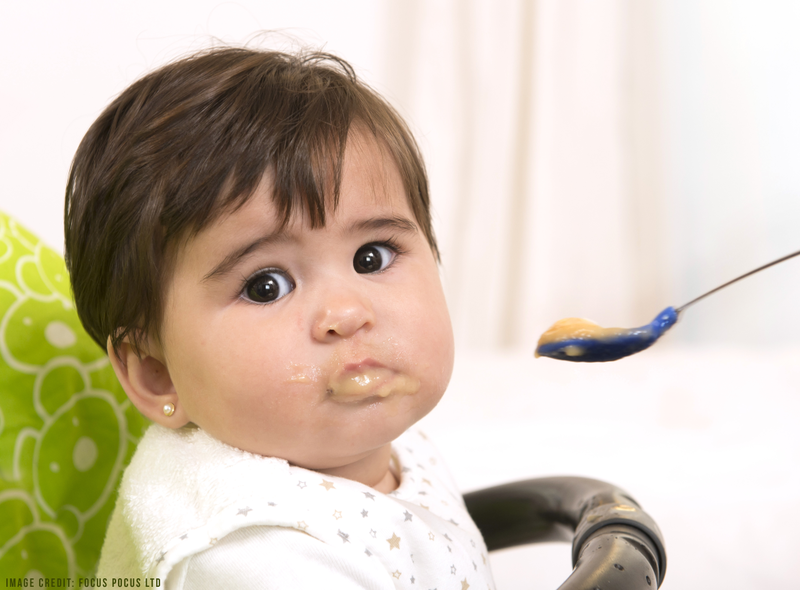 Just as proper nutrition promotes physical growth and is crucial for babies’ future health, proper linguistic nutrition promotes the mental growth necessary for future success. It’s almost impossible for a baby to grow up without any exposure to language, but many children still grow up in environments that lack sufficient language exposure. In one seminal study, researchers found that the number of words addressed to children differed dramatically across families of different socioeconomic statuses (SES)5. SES is a measure that combines income, occupation, and education to reflect a family’s economic and social position in society. Children from families in the highest SES category heard an average of 2,153 words per hour, while those is the lowest SES group only heard 613 words per hour. From these numbers, the researchers calculated that by 4 years old, the average child from a higher-income family hears a total of about 45 million words, while the average child from the low-income family hears a measly 13 million words. The authors referred to this disparity as the 30 Million Word Gap. The gap may result, at least in part, from the fact that parents who are struggling financially are often unable to devote the same amount of focused time to their children that parents with fewer financial struggles can6. Reduced linguistic input is one consequence of the quality-time deficit that lower-SES kids often experience. If a child from a low-income family enters school at age 4 after hearing 30,000,000 fewer words than his or her other classmates have, this child will immediately have an immense disadvantage. Because learning is sequential, in the sense that that many concepts build on each other, the child on the disadvantaged side of the word gap will have difficulty learning new information that requires an understanding of language. As a result of missing out on valuable linguistic input as a baby, this student may never catch up. The state of Georgia has launched an effort to close the 30 Million Word Gap7, acknowledging that “a lack of early language exposure has lifelong consequences,” like dropping out of high school, incarceration, becoming a teen parent, involvement in violence, unemployment, and poverty8. Their initiative, Talk With Me Baby, is being implemented mainly by spreading awareness. Because the word gap can have future physical health consequences and because almost all babies are seen in hospitals, nurses in particular are helping spread the message that babies are listening, even before they’re born. They’re absorbing what they hear, so they should hear as much language as possible. The website for Talk With Me Baby also advertises an app that parents will soon be able to download with features like topics to talk about, milestones to look for, reminders to talk, and resources. Raising a child is complicated. It can be hard to know what to feed your child, when to do it, and even how to afford the ideal nutrition. Luckily, providing babies with proper linguistic nutrition is fairly straightforward and accessible to all. What words should you feed your child? As many as you can! When should you feed your child his or her words? Whenever you can! Ideally, babies should hear not only as many different words as possible, but they should also hear as many different sentence structures as possible. Long sentences are the linguistic equivalent of milk: consuming them helps children’s cognitive foundations get strong enough to support all of the lessons and skills that they’ll learn in school. Perhaps best of all, words are free and we can all make them, which means closing the 30 Million Word Gap is within our reach.